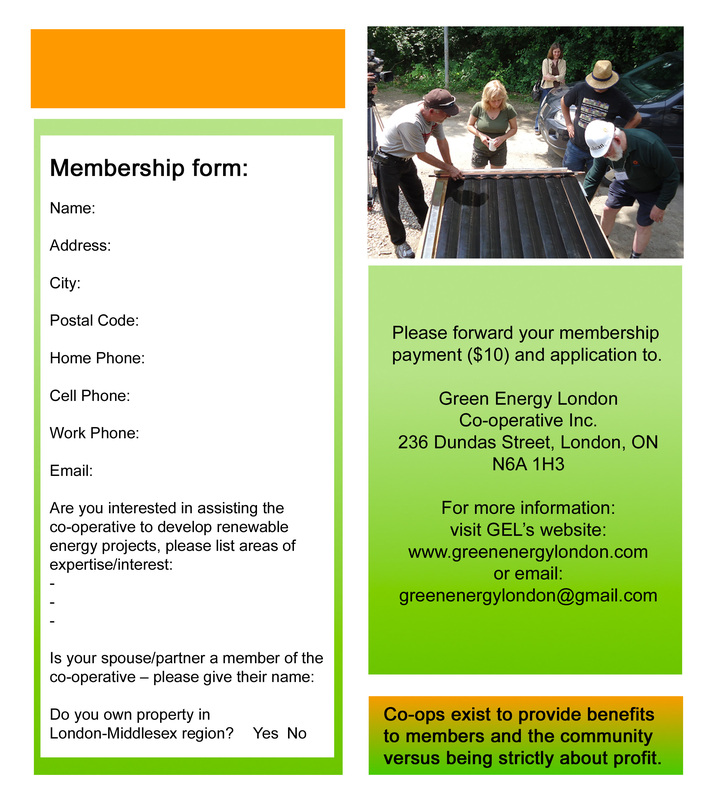 Become a member | Green Energy London Co-operative Inc.
A GEL Membership Share costs only $10, and entitles you to vote on co-op business and direction and make further investment. To view our brochure (PDF), please click here: GEL_co-op_brochure. 636 Marshall St, London, Ontario N5W 0A9 for more information! To print the membership form, click on the picture, click File, and then click Print. Alternatively, you can download a PDF version of the form and print it off. Becoming a member provides you the opportunity to support your community, help the planet, and invest in future energy efficient initiatives. · Local community investment opportunities and education initiatives are developed as well as expected returning capital. · Sales and lease agreements with land owners under a 20 year contract means low investment risk. · Local jobs are supported in the development and maintenance of projects. · Renewable energy production reduces the need for coal, natural gas, and nuclear generation and reduced impact of grid distribution line losses locally. · Support for solar feed-in tariffs will make Ontario a leader in renewable energy.